This part of the website is dedicated to the business Parish Council. Find out who your councillors are and how to contact them, what the council does and how you can join in. To represent the local community’s interests, for example, by commenting on consultations, planning applications (but please note that the final decision rests with Sedgemoor District Council) and at meetings at various outside bodies (eg Hinkley Point, Quantock Hills AONB). To help look after green spaces and footpaths. Parish Councillors give their time unpaid to work for the benefit of the community as a whole. They are volunteers and are not paid. Nether Stowey Parish Council normally has nine Parish Councillors. You can find more information about them below. John Roberts was re-elected Chairman at the Annual Parish Council meeting on 8 May 2017. Chris Pearson was welcomed as the newest Councillor at the meeting on 8 October 2018. Register of Interests: The Members’ Register of Interests forms have now been scrutinised by the Monitoring Officer (Sedgemoor District Council). Click this link to see the published list. Parish Council meetings are held at the Village Hall on the second Monday of the month (except in August). Members of the Parish are always welcome to attend and there is an opportunity for residents to raise matters of concern. Guidance for speaking at meetings is available here. You can also request a specific matter to be included on an agenda by contacting the Parish Clerk before the agenda is confirmed and no later than the Monday preceding a meeting. 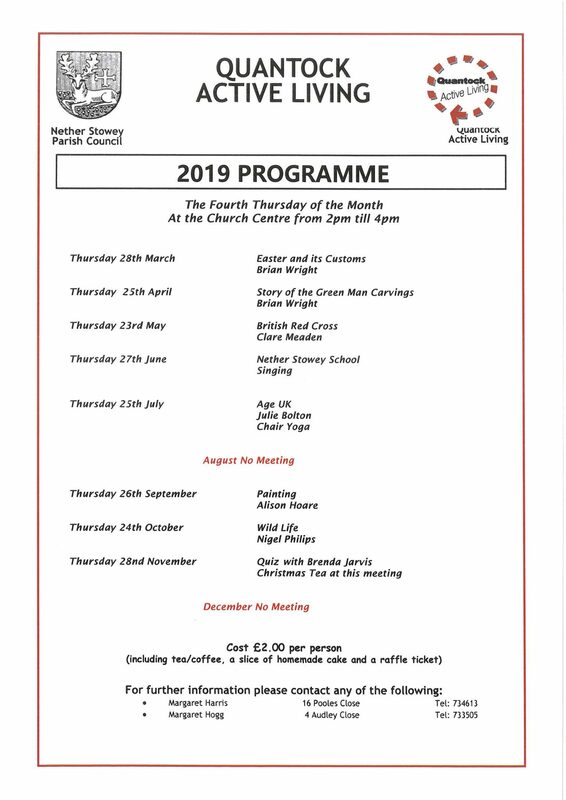 Agendas are posted on the Parish notice boards on the Wednesday before a Monday meeting and available by clicking the calendar item for the meeting on the home page. Click here for the minutes of previous meetings or click on the links left. Committee meetings are held as needed: agendas are posted in the same way as for Parish Council meetings. Please contact us if you have any questions regarding the work of the Parish Council, if you have any concerns you think the Council should be aware of or where it can help or support you. The Parish Council is supported by part-time Parish Office staff. The Clerk is Caro Slaymaker. The Clerk is the Officer of the Council, responsible for implementation of the Council’s decisions, administration of the finances and advising Council on its policy and procedures. Caro is assisted by Mel Catchpole. You can also contact any Parish Councillor directly, at their addresses below. A full list is available to download here. Committees: All committees except Personnel (Appeals) (ex officio member); Chairman of Neighbourhood Plan Working Group.